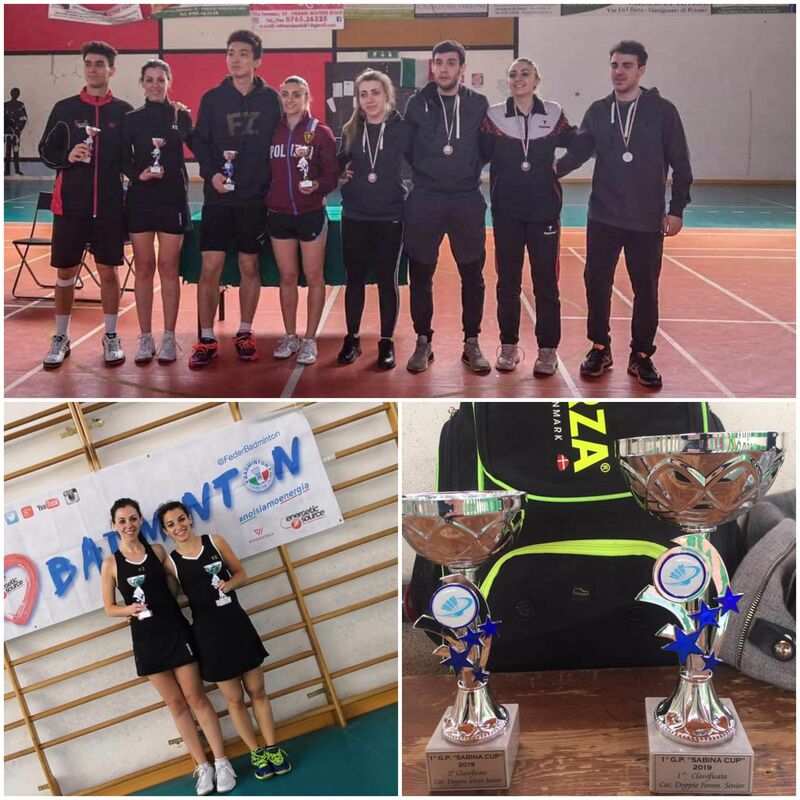 Last week, B’Kara BC and Malta International player, Fiorella-Marie Sadowski travelled to Rome, Italy to participate in the 1st Grand Prix Sabina Cup. Fiorella participated in all 3 available events; Ladies Singles, Mixed Doubles (partnering with Riccardo Biagioli of ASV MALLES), and Ladies Doubles (with Laia Oset Moncho of CB PITIUS), and playing in no less that 11 games during the two day competition. In the group stage of the Ladies Singles, Fiorella challenged Ludovica Ruggeri (S.S.LAZIO BADMINTON) and No. 2 seed Camilla Taramelli (BC MILANO). Fiorella won he first encounter convencingly 21-9 / 21-11 against Ruggeri, however she not able to produce her same level of play in the 2nd game against her more quoted opponent, losing her match 21-3 / 21-11. Despite this and thanks to the good score obtained in her 1st encounter, Fiorella made it through to the quarter final, were she had to challenge her Ladies Doubles partner Laia Oset Moncho (CB PITIUS) for a place in the Semi Final. Fiorella was looking more confident during this game , but had to bow out with her head high up against Laia, who eventually managed to win 21-17 / 21-15. In their first match of the Mixed Doubles category Fiorella & Riccardo had to face seed no. 3/4 Ivan Sotigu (BC ANGELO ROTH) & Arianna Pascucci (ASD BRACCIANO), which turned out to be a nail biting one. However, Fiorella & Riccardo managed to win this match in 2 straight sets, 21-18 / 21-19. Fiorella & Riccardo continued to go though the Quarter Final, after winning by a very comfortable score of 21-3 / 21-5 against Alessioa Foddai (SPORTINSIEME ROMA) & Olaya Otmani (SPORTINSIEME ROMA). In the Semi-Final, Fiorella & Riccardo had to challenge no. 1 seeds Giorgio Gozzini (GSA CHIARI) & Martina Albertini (GSA CHIARI). Fiorella and her mixed doubles partner knew that they had to perform at their best in order to beat the No. 1 seeds. This game proved to be very entertaining and both pairs performed at their best. However, Fiorella & Riccardo managed to take the upper hand in key instances throughout the match and won the game in a thrilling and breath-taking 3 setter, 21-16 / 17-21 / 23-21. After 20 minutes rest, Fiorella & Riccardo challenged Tonni Zhou (ASV MALLES) and Giulia Fiorito (G.S. FIAMME ORO). Similarly to the semi-final, this games also proved to be an entertaining one with some fantastic exchanges between both pairs. This was the first time Fiorella & Riccardo teamed up together, and unfortunately this this proved to be crucial in such a nerve racking game, as their partners managed to take advantage on certain instances. Zhou & Fiorito managed to win on a 3 setter, 21-18 / 16-21 / 21-11. Fiorella & Riccardo in their first competition together, should be more than satisfied to be placed 2nd overall in the 1st edition of this tournament. Fiorella & Laia overcame both their two opponents in the group stage of Ladies Doubles, in comfortable fashion; 21-3 / 21-6 against Olaya Otmani (SPORTINSIEME ROMA) & Beatrice Wielich (SPORTINSIEME ROMA), and 21-11 / 21-13 against Arianna Pascucci (ASD BRACCIANO) & Ludovica Ruggeri (S.S.LAZIO BADMINTON). In the Semi-Finals, Fiorella & Laia were challenged by Martina Albertini (GSA CHIARI) & Silvia Santi (GSA CHIARI). Both Fiorella & Laia looked comfortable in this partnership and secured a place in the Final with another convincing score of 21-11 / 21-9. The Final could have been a tricky one for Fiorella & Laia having played an extra match, given that their opponents Sofia Camerota (BC MILANO) & Camilla Taramelli (BC MILANO) were handed a walkover in the Semi-Final. However, Fiorella & Laia were determined not to let this condition their game or concentration, and in fact managed to overcome their challengers in the Final in 2 straight sets 21-12 / 21-17, thus claiming the right to be called “Champions” on Top Podium spot in this category.